GEOTAG geo-container is a highly permeable geotextile container woven in a special structure with tenacity Polypropylene or Polyester yarns which is seamed into a long cylindrical configuration. Geotag geo-container is a high functional geotextile tube which allows to form necessary structures or to reuse filled materials after dewatering dredged materials and sludge from water treatment facilities. 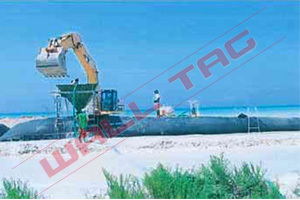 Geo-container is also applied for civil engineering, environmental and hydraulic industries including coastal erosion protection, beach & wetland restoration, breakwaters, ground reinforcement of civil engineering structures such as reclaimed land, artificial islands, formation of temporary roads, cofferdams, dewatering of dredged materials and sludge. Taking advantage of its structural flexibility, Geotag geo-container readily adapts for various landforms, field conditions and sewerage treatment plants. The excellent physical and seam strengths allow geo-container to build stable structures which are durable and safe.